I love a good cold bowl of gazpacho especially on hot, steamy days like we've been having, but it has to be a good bowl of gazpacho. It is so disappointing to order something called gazpacho and just get a bowl of cold tomato soup. To me, gazpacho is much more than just tomato, it's the perfect blend of all the vegetables that are in season. The typical combination of vegetables is tomato, cucumber and peppers, but when I saw the beautiful sweet corn that was finally here I knew I had to add it too. Now, I'm not sure I'll like gazpacho as much without it! I love the sweetness it adds to the soup plus the crunch it adds as a garnish. This is the perfect hot weather meal as the only cooking involved is the corn (well, ok I blanched my tomatoes for peeling). Other than that everything else just gets thrown in the blender. I serve the soup with some hearty white bread, usually what's left of the loaf I used in the soup itself. Husk the sweet corn. Cook in boiling water until crisp tender, about 5 minutes. Remove and let cool. Cut the kernels from the cobs. Put the garlic clove and two pinches of salt into a mortar and pestle. Crush until it forms a paste. Put the corn kernels in a blender, reserving a few tablespoons to garnish the soup later. Add the garlic paste, tomatoes, cucumber, onion, sweet pepper. Purée until everything is chopped very finely. Add the vinegar and olive oil. Put the bread pieces in a bowl and add 1/2 cup cold water. Let sit until the bread absorbs most of the water. Squeeze the water from the bread, reserving the water. Add the bread to the blender. Purée until smooth and creamy. If you want it thinner add the bread water a little at a time. Chill for at least an hour. Season with salt, pepper and cayenne before serving. Serve garnished with the reserved corn and a little chopped cucumber. Makes 2 - 3 main dish servings. nice and simple yet powerhouse of flavors. That looks beautiful! We don't have much of a summer in San Francisco, but tomato and corn season is here ...will need to make at least 1 gazpacho this year - perhaps if the temps rise over 70 degrees in our neighbourhood. Beautiful photo, btw. Sounds so light and refreshing! Gazpacho can have so many different flavors. I love the sweet corn addition here. Adding corn is such a good idea! I love gazpacho in summer. you're get some fantastic use out of that sweet corn--this is another winner! I made some gazpacho last week, but didn't get the beautiful red color of yours. I need to try your recipe. I especially love the corn in it. Great way to use the seasonal flavor. Hit this recipe on a search with our garden producing more tomatoes and cucumbers than we could handle, and having some extra roasted sweet corn on hand. 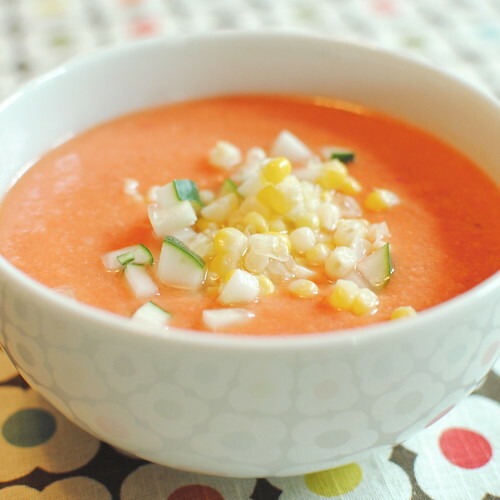 Great basic gazpacho recipe. We don't like to puree the gazpacho - we just chop everything well and leave it rustic. Also our corn was so sweet the final product needed a bit more acid so we added the juice of a large lime and a few extra dashes of vinegar. But this has it right overall for an awesome Midwestern garden gazpacho.